The 86th running of the Indianapolis 500 on May 26, 2002, will bring together two powerful symbols that stir the imaginations of enthusiasts around the world. Chevrolet's Corvette, an international performance icon, has been named Official Pace Car of this year's Indianapolis 500, the world's most prestigious open-wheel race. Chevrolet will pace the Indy 500 a record 13th time, and Corvette will perform the pace car duties for the fifth time since 1978- the most pace car appearances by a single brand. "This year's Memorial Day classic will showcase America's favorite sports car at the greatest spectacle in racing," said Corvette Brand Manager Rick Baldick. "This is a milestone event because it will signal the start of a yearlong celebration leading up to Corvette's 50th anniversary in 2003." "Chevrolet and Corvette have a proud and storied history with the Indianapolis 500," said Tony George, president and CEO of the Indianapolis Motor Speedway. "We look forward to having the 2002 Corvette pacing the greatest race in the world." The 86th running of the Indianapolis 500- mile race will also mark the return of Chevrolet to the most hallowed ground in American motorsports. Chevrolet will compete in the Indy 500 for the first time since 1993 with the all-new Chevy Indy V8 racing engine. Chevrolet won 86 Indy car races, including six Indianapolis 500 victories, and five series championships in 1986-93. "We are proud that Corvette has been named Official Pace Car of the 86th Indianapolis 500," said Kurt Ritter, Chevrolet general manager. "The excitement that builds at Indianapolis Motor Speedway from opening day until the checkered flag falls mirrors the excitement that is building around Corvette's 50th anniversary. "Chevrolet's racing heritage began with company co-founder Louis Chevrolet, who gained international fame as engineer and race car driver," Ritter noted. "I wouldn't be surprised if the bronze statue of Louis Chevrolet that stands outside the Hall of Fame Museum was smiling at the news about Corvette and Chevy's return to the Brickyard." Events celebrating Corvette's golden anniversary are planned from coast to coast. The Historic Motorama coordinated by the National Corvette Museum (www.corvettemuseum.com) on June 24-28 will consist of one example from each production year to honor the more than 1.2 million Corvettes that have been produced since 1953. 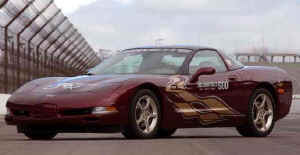 The Corvette that provides the platform for the Indy 500 Pace Car is equipped with a standard 5.7 liter LS1 V8 engine that produces 350 horsepower in production trim. Corvette incorporates advanced technology such as hydroformed frame rails, Active Handling System, driver-selectable suspension modes and optional Head-Up Display. "The cars that compete in the Indianapolis 500 are finely built machines that are designed for maximum speed," said Baldick. "Corvette is just as purposeful in its own right. For 49 years, Corvette has remained true to its two-seat sports car heritage. Corvette combines power, performance, handling and technology -while delivering the maximum amount of driving pleasure to those who value high performance." When Corvette leads the field of 33 drivers to the green flag on May 26, it will be the start of something big- for racing fans and for the Corvette enthusiasts around the world.